This exceptional and rare antique George II Newcastle sterling silver tankard has a plain tapering cylindrical form onto a spreading base. The body of this sterling silver tankard encircled with a plain applied girdle below the bright cut engraved initials 'GAY' framed between a barley stalk and a wheat ear. The tankard retains the original hallmarked domed hinged cover with an impressive shaped pierced decorated thumbpiece. The tankard is fitted with an opposing scroll handle which displays the contemporary engraved initials 'GA' surmounted by 'Y' to the handpiece and features a a shield shaped terminal to the lower portion. The upper portion of the handle is ornamented with a pendant drop design, incorporating the original hinge. This impressive tankard was crafted by the renowned Newcastle silversmith Thomas Makepeace I. 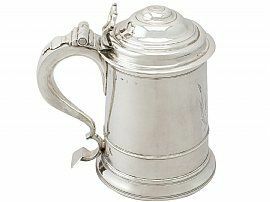 This antique tankard is an exceptional gauge of silver, exceptional quality an in excellent condition. There are a few minor surface blemishes, in keeping with the age and use of the piece. Full hallmarks struck to the surface of the body have wear in keeping with age and location. The maker's mark and lion passant to the rim of the cover, and maker's mark to the handle are clear, apart from the lion passant mark which has wear in keeping with age and location. Length from back of handle to rim 16.5cm/6.5"